Whether it's The Lord of the Rings, Blade Runner, or Star Wars, the most interesting aspect of these shared fantasy worlds are the amount of time and effort devoted to creating them. Though Star Trek has been around for nearly 45 years, the new film still required a substantial degree of rethinking to appeal to 21st-century sensibilities. Take the design of the U.S.S. Kelvin, the Federation ship from the film's prologue. Even though it only appears in a 5 to 10-minute-long sequence, a considerable amount of work was put into designing it. And rightly so, since the look of that ship, both inside and out, would serve as the foundation upon which the rest of the Federation aesthetic would be built. Eight pages are devoted to this ship and its environs, providing the reader with at least 25 photographs of the ship's bridge, its decks, its exterior, shuttlecraft, crew costumes, and even its props like the blink-and-you'll-miss-it communicator (which pays homage to the one from the original series. There are even informative tidbits like this one about the Kelvin crew uniforms, which "distilled the essence of old sci-fi, including stretch fabrics inspired by Flash Gordon serials." Descriptions like these not only help distinguish the photographs from one stage to another in the design process, but they help put the designs into context within the internal Star Trek timeline and the larger history of science fiction in cinema. Another intriguing avenue explored within the book involves designs that did not make it into Star Trek. This includes an extensive review of alien creature designs (including one based on the lizard-like Gorn from the series! ); a closer look at the design evolution for Nero (Eric Bana) and the rest of his Romulan crew; a 2-page look at the "Rura Penthe prison sequence," which would have introduced Abrams' version of the famous Klingons; and more. Particularly of interest to some is an alternate vision of Delta Vega, the icy planet to which Kirk (Chris Pine) is sent in exile. In the book, there are early illustrations depicting it as a desert planet—with an alien bazaar that bears more than a small resemblance to the Star Wars cantina—and would surely have inspired even more of the criticism that posited this was simply a Lucas-type version of Star Trek. 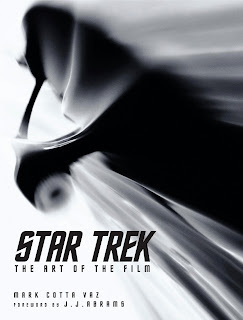 After a long dry spell where such nonfiction books exploring Star Trek are concerned, STAR TREK The Art of the Film is a welcome sight for this fan. I look forward to more books as detailed and objective as this one—whether about Star Trek or another design-heavy fantasy—in the future. Cover Image for STAR TREK: THE ART OF THE FILM. © 2009 Paramount Pictures Corporation. ® and © 2009 CBS Studios Inc. STAR TREK and related marks and logos are trademarks of CBS Studios Inc. All Rights Reserved. Titan authorized user. All Rights Reserved.